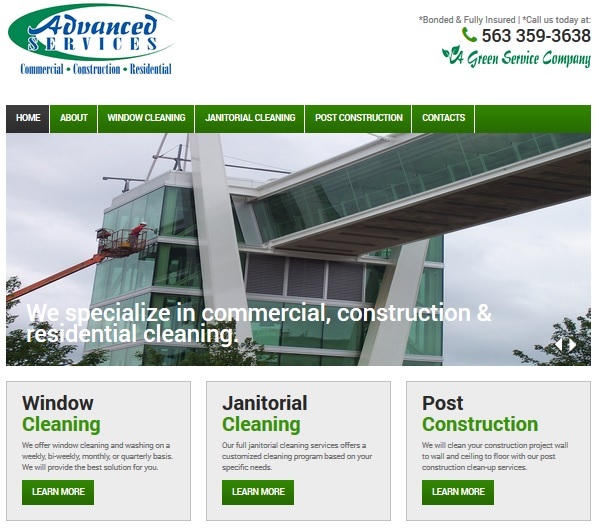 Advanced Services has been providing commercial, construction & residential cleaning services since 2004. Specializing in window cleaning, janitorial cleaning, and post construction cleaning to their many locations. Their locations not only include the Davenport, IA Quad City IL, IA area, but also include Des Moines, IA, Cedar Rapids, IA, and Rockford, IL locations. MoPoe & Associates teamed up with Advanced Services to strategically create a new website. We created a modern website design that looks good on all mobile devices, is search engine optimized and creates a friendly user experience. After a few weeks of the website going live, they started to receive more phone calls for quotes. To learn more about Advanced Services, please visit their website at www.advancedservices-ia.com.